This paper presents the hardware, perception, and planning tools that comprise our system. An environment characterization algorithm identifies features in the environment that can be augmented to create a path between two disconnected regions of the environment. 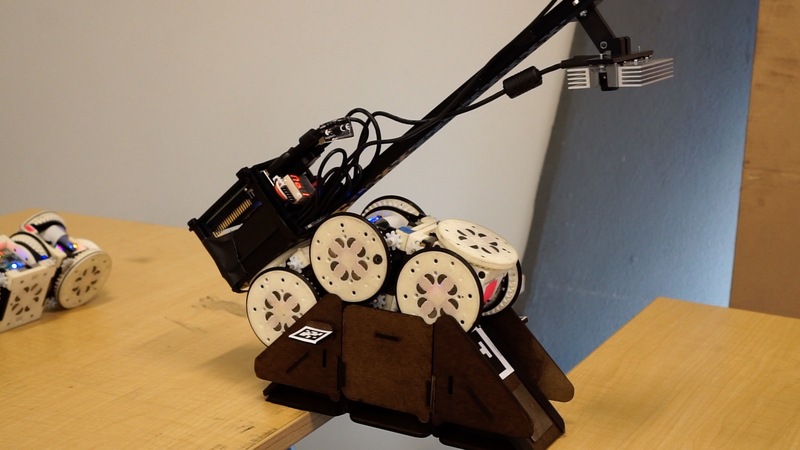 Specially-designed building blocks enable the robot to create structures that can augment the environment to make obstacles traversable. A high-level planner reasons about the task, robot locomotion capabilities, and environment to decide if and where to augment the environment in order to perform the desired task. We validate our system in hardware experiments. T. Tosun$^*$, J. Daudelin$^*$, G. Jing$^*$, H. Kress-Gazit, M. Campbell, and M. Yim, “Perception-informed autonomous environment augmentation with modular robots,” in Ieee international conference on robotics and automation, 2018. Oct 30, 2018 | Filed under Modular Robots and tagged with tariktosun.